*Rotherham deducted four points. Non-fulfilments v Hucknall and Sutton. *Leeds deducted two points, unregistered player. Sheffield rounded off a great first half of the season, retaining a 100 per cent record in men's Division Two with three impressive victories at Lancaster (20/21 October). They will be joined in Championship 1 by Welsh Wanderers, Caledonia, Sutton & Cheam and Hucknall, plus Invicta, Polytechnic and West London Penguin from Division One. Croydon Amphibians, Rotherham and Exeter compete in Championship 2. Sheffield’s opening 16-7 win against Hucknall was followed by an 11-9 defeat of Caledonia, including hat-tricks by Joel Abbott and George Rix. Sheffield then proved too good for a Sutton & Cheam side that, with Hungarian duo Gabor Turzai and Gergely Fulop in dominating form, had looked particularly strong on day one, beating Welsh Wanderers 14-10 and Croydon Amphibians 17-10. On this occasion, Sheffield’s all-round team work shone through and they triumphed 17-12, with Elliot Kelly netting four. Caledonia also lost on the opening day to Rotherham, going down 7-6 after the Yorkshire side had led 5-0. But a superb virtuoso display by nine-goal Chris Campbell ensured the Scots’ 18-12 victory over Exeter. Dan Laxton scored eight of Welsh Wanderers’ goals in a 15-3 defeat of Hucknall. Croydon couldn’t avoid the drop into Championship 2 despite beating Exeter 13-7 (Exeter actually won the third period 5-0!) and Rotherham 16-12. Another Hungarian, Csaba Rekasi, scored four for Croydon. South Derbyshire provided much of the drama when the Division Three programme reached its climax at Walsall (13/14 October), qualifying for Championship 2 having won only one of their first five matches. A runaway 25-9 victory over Cambridge – including eight goals by Neil Swainson and seven from John Dyer – meant that the winners of the South Derby-Worthing match on day two would finish in the top five and go through. Worthing were always playing catch-up after trailing 8-3 at half-time and eventually South Derby won 11-8. Team Northumbria, Birmingham, Leeds and Carlisle also qualified, while Worthing, Cambridge and Manchester Hawks dropped into Championship 3 where, subject to confirmation, they will face Watford, Ealing, University of Bristol, Otter and Bridgefield. Leeds Sharks shrugged off the handicap of an earlier deduction of two points – for including an unregistered player – although both their victories at Walsall were nail-biting affairs. They edged out Carlisle 11-10, resisting a late Carlisle rally after leading 8-3; then a goal a minute and half from the end by Shaun Greatorex secured a 13-12 victory over Manchester Hawks. Cambridge may have struggled this season, but they came good in their final game, ending Team Northumbria’s unbeaten record when a Nick Ludford goal clinched an 8-7 win. In Division Four, two wins lifted University of Bristol out of the bottom three. They dented Grantham’s top five ambitions with a 12-11 win – never much in doubt until Grantham recovered from 10-7 down to equalise at 11-11 in the last quarter through Ben Caulfield. Kieran Whittle scored the winner with 30 seconds remaining. Then Bristol beat Watford 22-10, with Shaun Taylor and Charlie Harbot both netting five. Invicta rounded off their divisional programme with a well deserved first win – 13-9 against Ealing, including four goals by Tom McDonald. Solihull maintained their dominance of Division Five, hammering 2nd City Birmingham 22-5, Sheffield Dolphins 19-6 and Old Whitgiftians 18-8. Watford Water Polo, in association with ASA London Region (North), have jointly funded a visit to Rome for 26 junior players during the October School half-term. The young squad, led by team manager Nikki Baker and assisted by head coach Nik Jovanovic – plus two Level One coaches – are spending eight days training at the Ostia Federal Center, where facilities include 50-metre indoor and outdoor pools as well as a gym. Apart from one rest day, reserved for a sightseeing trip around Rome, the squad’s daily programme has featured double training sessions, gym work and friendly matches against Italian club sides. Watford also split into under-17 and under-15 age group teams for a round-robin international tournament involving Italian clubs Acilia WP, ASD Village, CC Lazio, Racing SCN and Akrosport. EVERGREEN COLES MAKES HIS MARK– AFTER A GAP OF 36 YEARS! It’s never too late to make an impact in the British League! In men’s Division Five, 2nd City Birmingham needed goalkeeping cover for two of their matches at Walsall (13/14 October). So they drafted in Mark Coles – for his first appearance in national league water polo for 36 years, which must be some sort of record. Mark last played for Leamington in the old men’s National league. Since then, he has turned out for Camp Hill Edwardians, who currently play in Division 2 of the Midland League. Mark is no stranger to record-breaking. 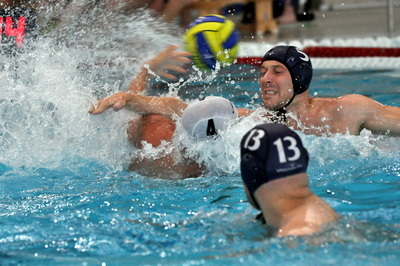 He was also a member of the Camp Hill team that broke the world record for the longest-ever water polo match. And it’s not only water polo veterans who are making the news . . .
Matt Helps, who is just 14, notched two goals for Old Whitgiftians in the men’s Division Five match against Solihull at Walsall (14 October). Does that make him the youngest-ever British League/National League scorer? Matt, the son of Mickey Helps, who played for Sutton & Cheam in their grand slam era, is a member of Croydon’s under-15 team, winners of the ASA national age group title earlier this year. Father Mickey is coach of the squad. Portobello pulled out all the stops to ensure that staging of the first-ever BWPL weekend in Scotland (6/7 October) – part of the Edinburgh club’s centenary celebrations – was an outstanding success. Appropriately, perhaps, Portobello were involved in the dramatic final match at the Royal Commonwealth Pool – a winner-takes-all clash with the much-improved Polytechnic team to decide the last qualifier for the Super 5s. There was plenty of tension in a large crowd as Polytechnic, led by Carlos Ardid, recovered from 3-1 down after the first period to level at 5-5 towards the end of the second. 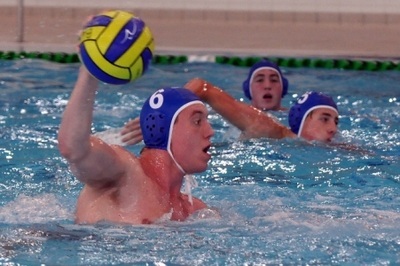 In the last minute of that quarter, however, brothers Fraser Rutherford (Blue 13 in the picture above) and Neilson Rutherford (Blue 5) scored vital goals for the Scots – who went on to win 12-8. It was a great weekend for Cheltenham. As happened last year, they completed the Division One programme in first place after beating champions Lancaster 11-9 – including three goals by Joel Thomas – and Invicta 14-4. They finished level on points with Lancaster, but topped the division by virtue of the result in the Lancaster game. With one exception – Bristol for West London Penguin –the Super 5s line-up this year will be the same as last season. Manchester beat Invicta 16-8, including four goals by Mike Bourne (pictured above), but on day two lost 13-7 to a Lancaster team inspired by six-goal Alex Parsonage. GB captain Craig Figes and Matt Thresher both scored hat-tricks in Bristol’s 12-5 defeat of Portobello. There were six more goals for Figes against youthful Penguin, who were outplayed 21-2. Great Britain Olympian Alex Parsonage ensured that Lancaster chalked up two more victories at Ponds Forge (29 and 30 September). The left-hander was too good for Polytechnic, scoring eight in a 14-3 win. Then he added six more against Portobello, who were beaten 14-10. Portobello won the last three quarters against Manchester, each by a single goal, but this was to no avail. A 5-1 lead for Manchester in the first period was eventually just enough to secure an 11-10 victory. Manchester also beat Polytechnic 14-8. Sheffield are riding high in Division Two. They beat Caledonia 13-8 - including four goals apiece for George Rix and Chris Howard - and then recovered from 7-4 down after two quarters in their derby against Rotherham to win 12-10. Exeter claimed their first points, defeating Sutton & Cheam 14-11. Our picture (by Dave Evans) shows James Hadley, of Hucknall, lining up a shot against Croydon Amphibians' goalkeeper Hadley Potter. There were plenty of goals and also close finishes in Division Three, where Team Northumbria trailed 5-0 in the first period but recovered to draw 8-8 with Carlisle and retain an unbeaten record at the top of the table. Cambridge notched their first points of the season when Nick Ludford's fifth goal with just a fraction of a second remaining gave his side an 11-10 victory over Manchester Hawks. In Division Four, a goal in the last second by Orion Ganase earned Otter a 16-15 victory over Bridgefield, for whom Roger Kennedy scored eight. Bedford scored twice in the last two minutes through Torben Cattley and Sam Parry to grab a late point in a 12-12 draw against University of Bristol. The battle for places in the Super 5s hotted up at Hengrove, Bristol (15/16 September) as the home club, including GB Olympic captain Craig Figes for the first time this season, improved their prospects by winning both their Division One matches - 18-8 against Cheltenham and 9-5 against Invicta. However, Cheltenham are already more or less guaranteed a top five spot. They bounced back from the disappointment of the Bristol match by hammering West London Penguin 22-8. Mark Banwell, the division's top marksman, bagged seven. The score sheet also featured Cheltenham goals by two ex-internationals very much of pre-2012 vintage, Dave Edwards and Jerry Birmingham. Invicta and West London Penguin shared the points in an 11-11 draw. Having trailed 8-6 midway through the second quarter, Invicta hit back to lead 10-9 in the fourth. Gergo Szabo's fifth goal for Penguin levelled it at 10-10 and he scored again from a man-up with 48 seconds remaining. Oli Bray claimed the final Invicta equlaser just 24 seconds from the end. In Division Two, Lee Copley scored seven for Hucknall against Caledonia and still finished on the losing side. Caledonia held a comfortable 13-7 lead at one stage but faded in the last quarter, when Hucknall added five of their goals. International Dan Laxton returned to action with Welsh Wanderers after a stint playing in Holland and scored six in a 16-3 defeat of Croydon Amphibians. That proved to be little more than a gentle warm-up before facing Exeter - this time he scored ten in a 17-9 win. Andy Barry contributed five for Exeter, including four in one quarter. Sheffield and Caledonia also won their two matches. Rotherham withdrew from the weekend's programme due to team-raising difficulties. 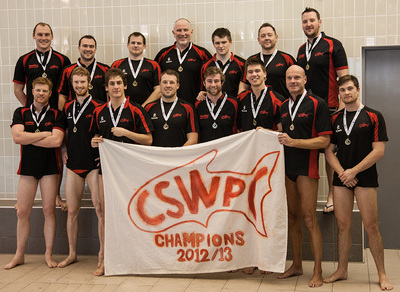 At Walsall, Team Northumbria, Leeds Sharks, Carlisle and Birmingham won their opening fixtures. Solihull made a confident return to the league in Division Five with emphatic victories in three matches. 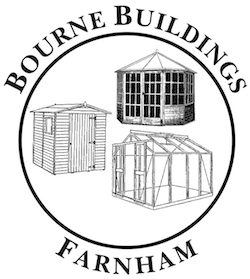 See divisional results pages for all the latest scores and tables. Lancaster and Cheltenham are already handily placed to qualify for the BWPL Super 5s after winning their three matches during the opening weekend of the Division One campaign at the new Hengrove pool, Bristol (1/2 September). The two London clubs found the going particularly tough against the early pacesetters. West London Penguin crashed 24-5 to Lancaster, a scoreline that could have been even worse but for some valiant defending by Penguin's goalkeeper, Sacha Fellica. Then Polytechnic suffered even more against rampant Cheltenham, whose 29-5 victory featured a ten-goal haul by Mark Banwell. It was great to see half a dozen of Great Britain’s Olympic team turning out for their clubs. 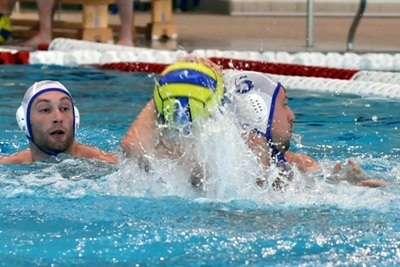 Rob Parker, briefly available for his home town team Cheltenham before heading off to professional commitments in Spain, showed why he was GB’s top marksman at London 2012 with a powerful eight-goal performance in an 18-9 defeat of a youthful Manchester team. 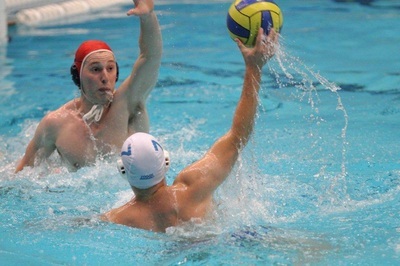 Olympians Alex Parsonage (5) and Ciaran James (4) were Lancaster’s chief scorers against Invicta, who were beaten 17-8. Manchester recovered from their reverse against Cheltenham, defeating Penguin 13-7 and then Bristol 15-5, including four goals by another GB international, Joe O’Regan. Polytechnic’s earlier games were much closer than their Cheltenham debacle. They trailed 7-2 after the opening quarter against Bristol but then remarkably scored seven goals without reply. With two and half minutes to go, Luke Jones netted to give Poly a 12-11 lead – only for Carl Wyatt to claim a man-up equaliser with just 14 seconds remaining. Against Invicta, Poly recovered from 7-4 down to lead 8-7, only to lose 10-9 when Conrad Rhodes scored the winning Invicta goal two minutes from the end. Portobello lost 12-7 to Cheltenham but then beat Penguin 15-12, including six goals from Ivan Iosa, an impressive new recruit from Spain. Portobello then added two more valuable points with a 12-6 victory over Invicta. Top: Joe O'Regan, fresh from the London Olympics, in action for City of Manchester. Middle: Mark Banwell (with ball) lines up another shot for Cheltenham, watched by Rob Parker. There may be something like 60 years in age between them. 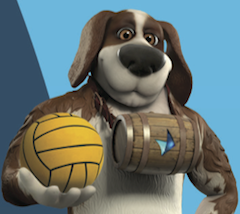 But Jack Jones and Rob Parker share the same honour – Cheltenham water polo players who have proudly represented their country at the Olympics. The Cheltenham club staged a tribute dinner for both men at the town’s Rising Sun Hotel. Altogether, there were almost 80 people present, including many past and present Cheltenham players as well as the town’s Mayor. Jack played in the 1948, 1952 and 1956 Olympics, captaining Great Britain on the third occasion. Our picture shows Rob wearing his 2012 Olympic blazer – with Jack in his blazer from 1956. Rob was due to take part in the Olympic athletes’ open top bus tour on 10 September before heading for Spain, where he plays for Barcelona’s CN Catalunya. All smiles from three of Great Britain’s Olympians! 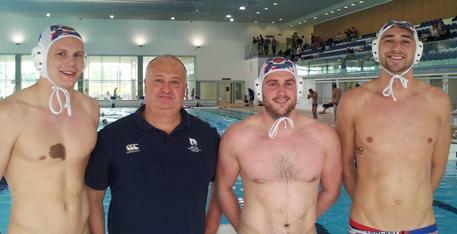 Pictured with BWPL chairman David Andrews at the new Hengrove pool, Bristol, are (left to right) Glen Robinson, Alex Parsonage and Ciaran James. The Lancaster trio were showing off the set of new customised caps their club received for winning the 2011 BWPL title from one of our sponsors, Waterswim, the Dutch company which already sponsors the current men’s and women’s champions in Holland. Waterswim also presented new caps to the 2011 BWPL women’s champions, City of Manchester. For more details about Waterswim, go to www.waterswim.co.uk. cheltenham's title after 42-year gap! After a 42-year wait for a national league title, Cheltenham finally celebrated success in the Super 5s at Guildford (19/20 January). There might have been a temptation to ease up after making sure of victory on day one. Not a bit of it! In the very last match of the season, Cheltenham hammered old rivals Bristol 26-9 with a sparkling display highlighted by clinical finishing. It was an indication of the all-round strength of the squad that, of the 'out' players, only ex-GB star Jerry Birmingham didn't feature among the scorers. Cheltenham piled on the agony for Bristol with ten goals in the final quarter. Ironically, it was Bristol who began the weekend as the only team capable of catching Cheltenham. After Cheltenham won their opening game - 17-9 against Portobello - Bristol needed to beat Lancaster to stay in contention. Watched by a nervous Cheltenham squad, they had their chances to do so. Although Lancaster led 12-10 after three periods, Bristol then laid siege on the Lancaster goal, but missed a series of clear-cut chances as well as finding goalkeeper Marc Robinson in outstanding form (pictured against Bristol by Trevor Hyde). In the end, Lancaster won 15-12 and Cheltenham were in the clear. 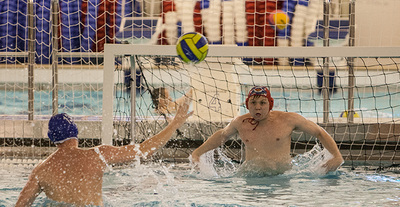 Cheltenham's long history of water polo success has relied to a great extent on homegrown talent. These days, the British League squad includes the likes of Bernat Jakupovic, a very talented 17-year-old Hungarian, Max Gerasimov, from Moscow and those remarkable, ageless ex-internationals, Dave Edwards and Jerry Birmingham. But the vast majority of players began as juniors. And coach James Ross is proud to point out that, apart from goalkeeper Elliot Murphy, every member of the BWPL squad lives in the town. Ross is now looking to the future and seeking more success at the British Championships and more experience competing in Europe. Significantly, too, Cheltenham's strength in depth is such that the club will be applying to enter a team in men's Division 5 next season. "Currently, it's difficult to blood younger players at British League level - it's a big step up," he said. "Adding another team would bridge the gap and give extra encouragement to some of our developing youngsters. "For now, we're thrilled to have won the league, especially as we have been strong contenders for six or seven years without being quite consistent enough to put together the back-to-back wins you need to get to the top. "This season, we have been more consistent, avoiding the slip-ups that were so costly in 2011 when we missed out after going through the first phase of the season without losing a game. It was a measure of our progress that we were able to beat Lancaster in their own pool - always a huge challenge." Ross added: "This has been a great season and I'd like to express our club's thanks to the league management and officers for their efforts in organising such a well-run competition." Cheltenham team line-up (picture by Trevor Hyde): Back row, left to right: Will Middleton, Max Gerasimov, David Taylor (captain), David Edwards, Iain Greig, Lee Barnes, James Ross (coach). Front: Mike Thomas, Elliot Murphy, Guive Shafie, Mark Banwell, Adam Legge, Bernat Jakupovic, Jerry Birmingham, Joel Thomas. Lancaster finished runners-up to Cheltenham. In addition to victory over Bristol, they beat Manchester 11-10 when Alex Parsonage claimed his seventh goal from a penalty with just 39 seconds remaining. It was a similar, frustrating story for Manchester against Portobello. Again, they lost 11-10 - and to a goal 23 seconds from the end. Manchester had led 7-4 at the halfway stage, but the Scots staged a tremendous rally in the late stages to end their season on a high note. For a second consecutive year, Liverpool Lizards' Kathryn Fowler has ended the season top goal-scorer in the women's Super 5s. She notched 25 - one goal ahead of teammate Katie Hesketh. The men's trophy will go to Alex Parsonage, of Lancaster. His tally of 32 was six more than nearest challenger Matt Thresher, of Bristol Central. Click on Statistics page for leading scorers and major kings in all divisions. Leeds Sharks player Shaun Greatorex is conducting a survey of BWPL male players as a key element of a paper he is preparing for his degree at Leeds Metropolitan University. He'd welcome support from as many BWPL teams as possible. Please email him on s.greatorex3525@student.leedsmet.ac.uk for more information.